We had hoped for following winds for our sail from St. Petersburg to Estonia, but the wind gods thought otherwise. We started out with a bit of wind from the east and sailed for a couple of hours, but then the wind died, and the gnats descended on us as we motored westward. Near sundown, the wind turned west and brought thunderstorms. We motor-sailed through the night and were able to leave Russia with a straighter course than we entered, arriving in Vergi, Estonia about 24 hours after leaving the St. Petersburg Customs Dock. 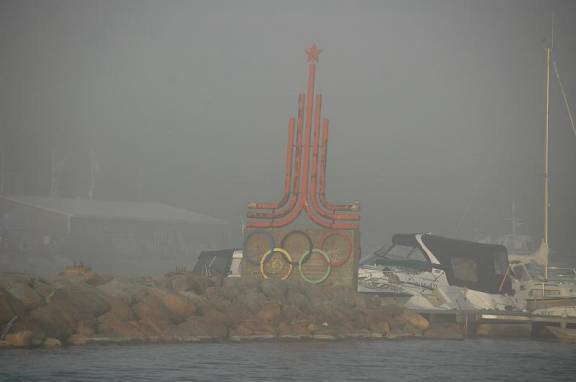 Vergi had received funds to establish a modern marina … some work was done but never completed. They have neither the facilities nor local interest to be anything other than a local pleasure craft port. 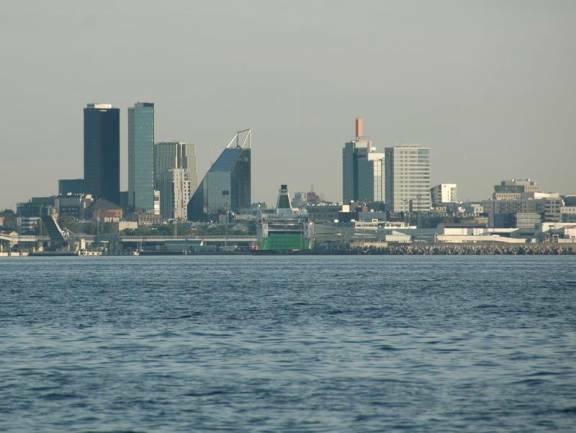 The 65-mile trip from Vergi to Tallinn (Parita is the pleasure craft harbour) was in a dead calm. We arrived in at the crowded marina in Parita on July 15, taking one of the last spaces for large boats. 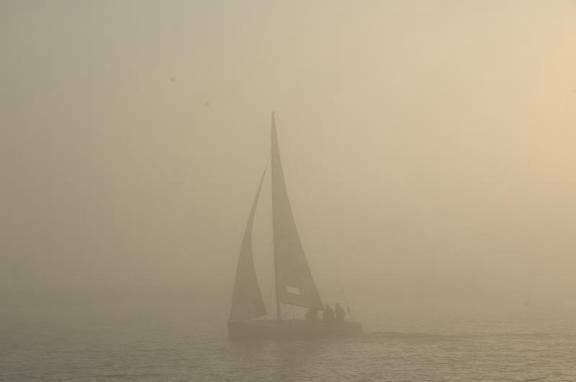 Just after we were safely moored, dense fog rolled in. 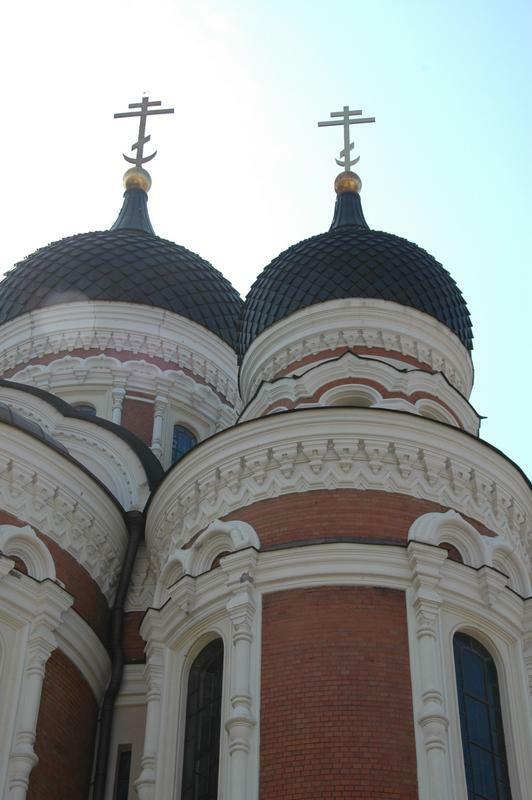 We spent a couple of days in the old town of Tallinn. It has been beautifully reconstructed and the gardens are lovely, but in doing so it is almost too much a Medieval Disney World. There are 5-6 souvenir shops and twice as many restaurants / cafes/ pubs on each block. It is very commercial, but also very pleasant. 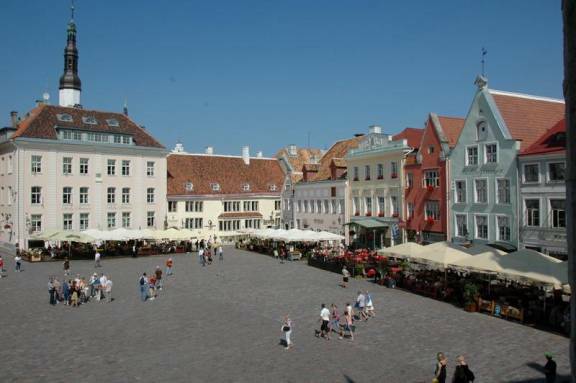 Tallinn was one of the centres of the Hansaetic League in the late Middle Ages (after Visby … see below). The German / Dutch influences in the architecture and culture are strong. We meandered through the “downtown” area of the old city (literally closer to the water rather than on the hill) and toured the old town hall. There were various displays depicting the development of Tallinn as a commercial centre in the Baltic. The view from the tower on the town hall was great. Near Fat Margaret’s Tower, the entrance from the port, we ran across a film shoot. Much of the original wall of the old city is intact, with gates and towers. One can walk along some parts of the wall and climb into some of the towers. 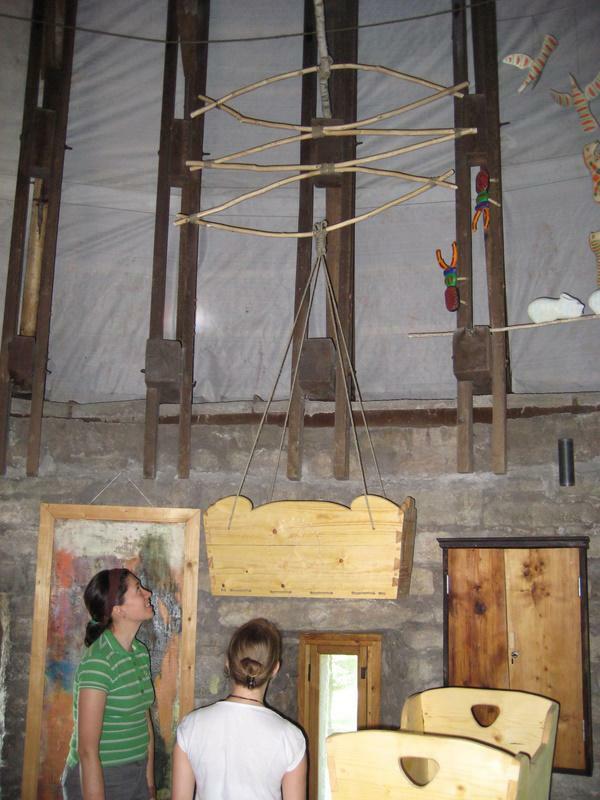 One of the towers displayed crafts made by wood artisans. Tallinn had a garden competition this summer, and the contestant gardens were still planted. Some were lovely, some utilitarian, but one was outrageous. 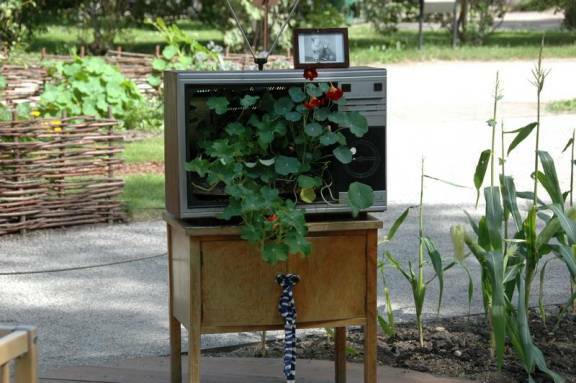 It used discarded household items (chairs, TV sets, etc.) as pots for the plants. 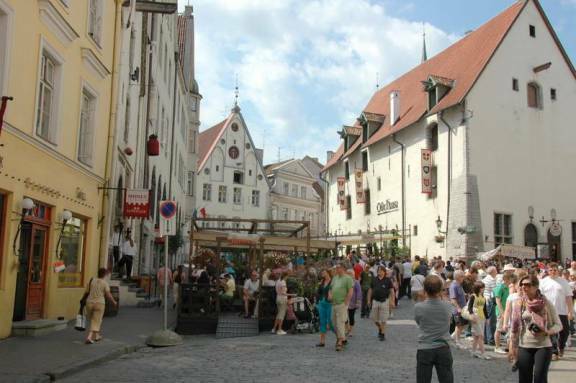 The old town is divided into the lower town (downtown), most popular with tourists, and the upper town or Toompea, which is where Alexander Nevsky Cathedral is situated. 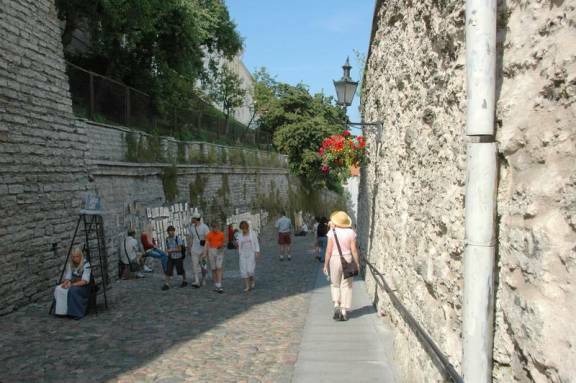 Pathway along the wall leading from the upper to the lower town. Local artists showing their wares. We found several North American-styled supermarkets and re-provisioned Pilgrim. It was so much easier dealing with the Roman alphabet again, and Estonian is close to Finnish, so Brian could decipher most of the labels. Just before we left Tallinn, on the bus from downtown Brian was pick-pocketed, loosing credit and bank cards, a small amount of cash and Tallinn bus tickets. We were so careful in St. Petersburg, but let our guard down in Tallinn. Our last view of Tallin. It was hard to imagine the old town seated down among the new skyscrapers. I wonder how many of them will be standing 400 years from now. 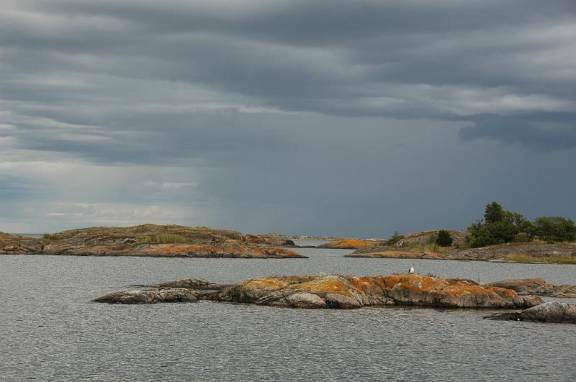 Of all the Baltic cruising we have done, the Swedish archipelagos have been the most satisfying, followed closely by the Finnish / Ålands archipelagos. 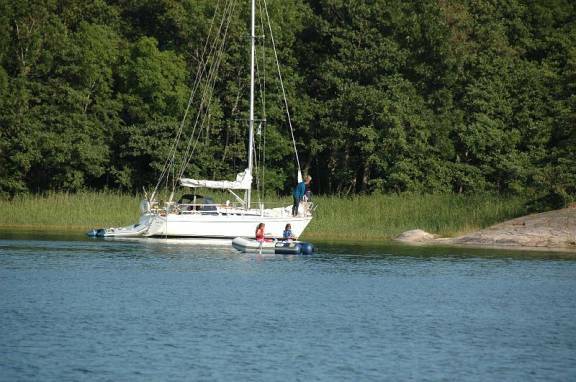 The harbours in Estonia are shallow and most of the moorings are for smaller, more maneuverable boats than Pilgrim. 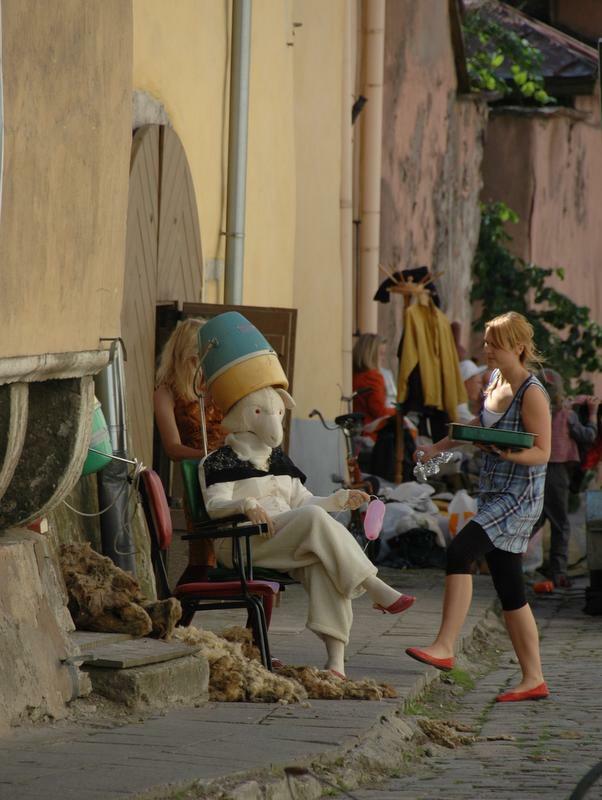 We enjoyed Kurresaare in 2008, and the only other city we were interested in seeing was Happsalu. 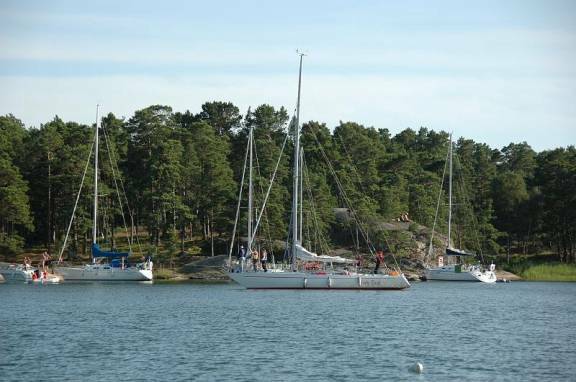 Therefore, we decided to skip over the difficult Estonian harbours and head directly back to the Stockholm Archipelago. 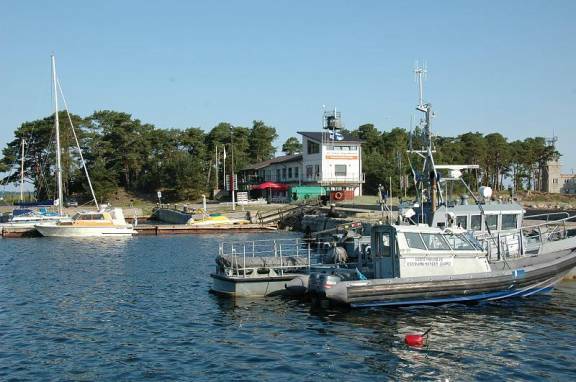 The trip from Tallinn to the Stockholm Archipelago entrance is 200 nautical miles. The forecast was for strong east winds for just 24 hours in between west winds. We left Tallinn in a calm at 8PM and motored through the night on a calm sea. At dawn the wind began to build from the east, and by 7AM we had enough to sail with the mizzen and Genoa (our downwind sail combination). The wind built to 22 knots, and we were beginning to think that North Baltic crossings for us entailed 20+ knot winds from the stern. 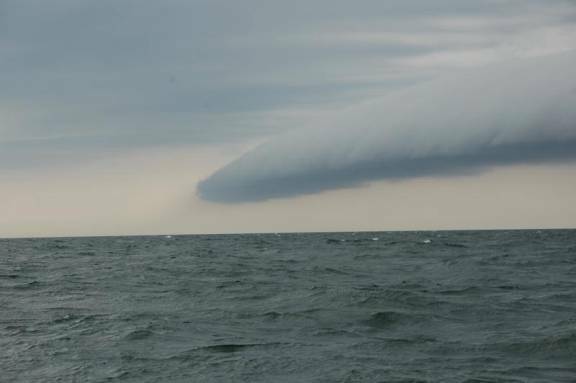 Fortunately, the waves did not build as high and chaotically as for our eastward crossing in mid-June, but we did go through a storm with amazing clouds. During the windy spell we had a bird passenger. 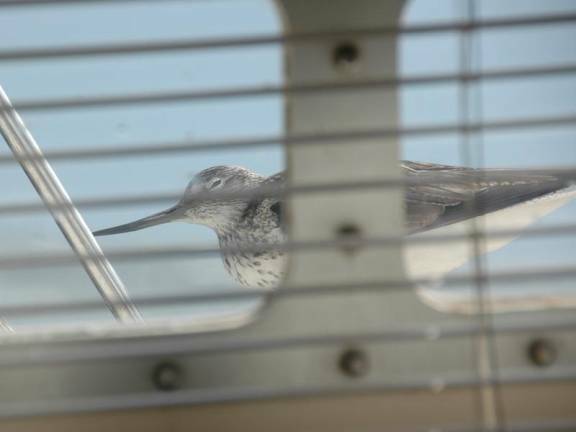 We think it was a greenshank or curlew. It had a very long beak and legs, so was definitely a wader who was blown off course. The bird clutched our caprail for about an hour of the strongest wind, appreciating the ride, but not liking the wave motion, and left as soon as s/he had the strength to fly on. By Sunday evening the wind died, but of course the waves did not, so we motored again through the night with enough wave to cause a slightly uncomfortable yaw in our motion. 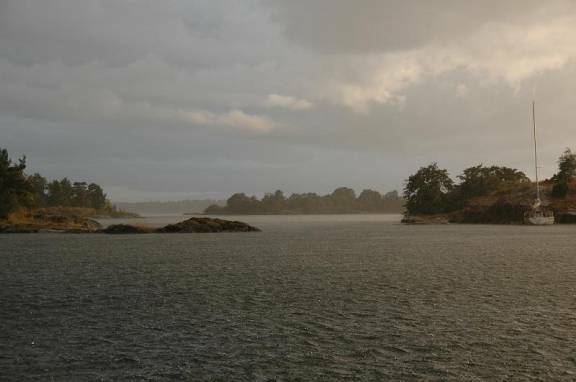 At dawn we arrived at the entrance to the archipelago, and within ¼ of a mile, the forecasted west wind hit us like a brick wall … from 0 to 20 knots within a minute. The wind was accompanied by heavy rain. 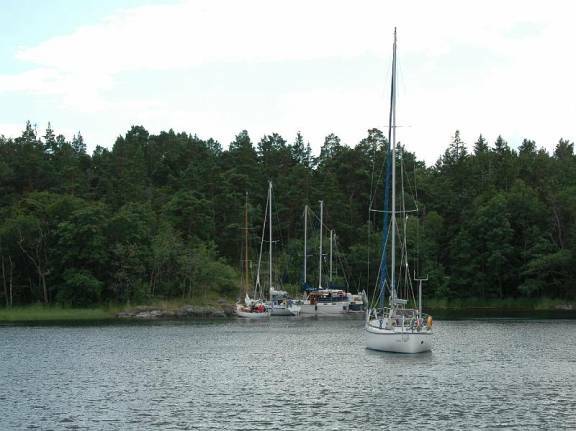 Our selected anchorage (Norrviken) was about 8 miles into the archipelago … almost 2 hours with the strong headwind. When we arrived at the anchorage, it was chock-a-block full. We headed further south and found a great anchorage about 3 miles further south on Munkö Island, completely protected from the SW winds and waves, and dropped the hook at 6:30. Although we motored more than we would have liked, it was all in calm (but wavy) conditions. 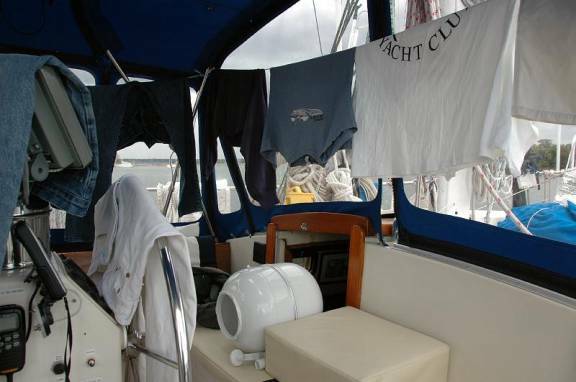 We spent a couple of days at Munkö, doing some laundry with our “wonder washer,” cleaning the boat, and exploring in the dinghy. 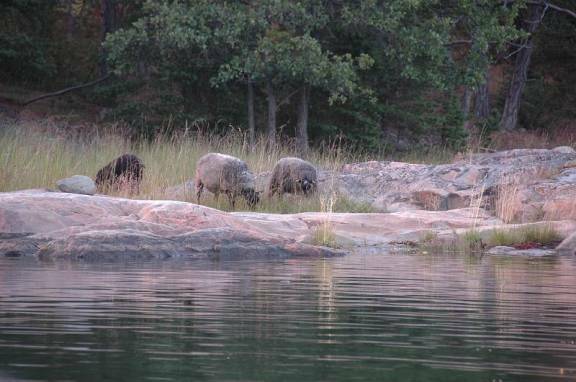 We learned that the island was infested with ticks, so we did not venture too far along a poorly trodden trail. Munkö is a nature reserve and has many varieties of orchids, but since they would not be in bloom, we decided not to risk Lyme’s disease and ticks and returned to the boat. We were visited twice by a boat-store… a boat with fresh bread (cinnamon buns!) strawberries, candy, ice cream, and soda pop. We bought bread and strawberries, and would love to see the business model for the enterprise. We have often thought such a service would be great in the North Channel in Ontario. 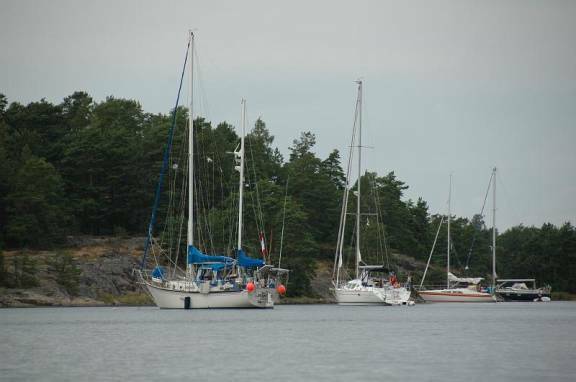 We moved another 20 miles south to Råmöhamn, another anchorage we had visited in June and also August 2008. Once again the harbour was filled with boats, mainly stern-anchored with a bow tied to shore. 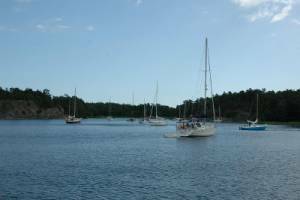 On July 25 we left the Stockholm Archipelago and moved further west to Fifång Fladen. 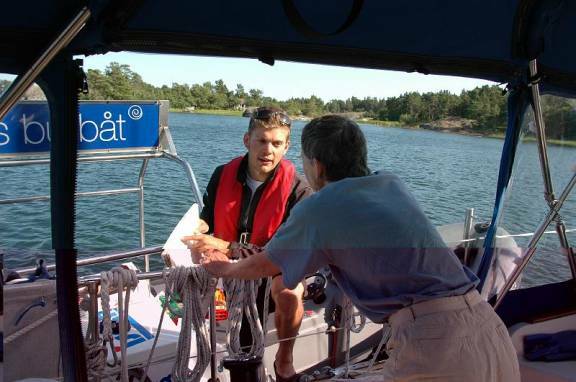 We took a small boat channel north of Landsort, the southernmost part of the Stockholm Archipelago. We had done this route in June going east. That was the day it was so foggy we couldn’t see anything. Today the visibility was good. Once we got through the tight passage, we faced an open “lake” open to the southwest with waves and wind. 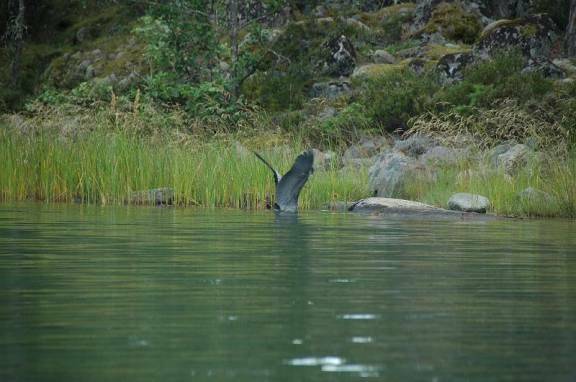 Rather than go to our original anchorage, we decided to go north, and ended up in Fifång Fladen … a delightful spot … along with about 40 other boats, half of which are anchored and tied to the rocks. 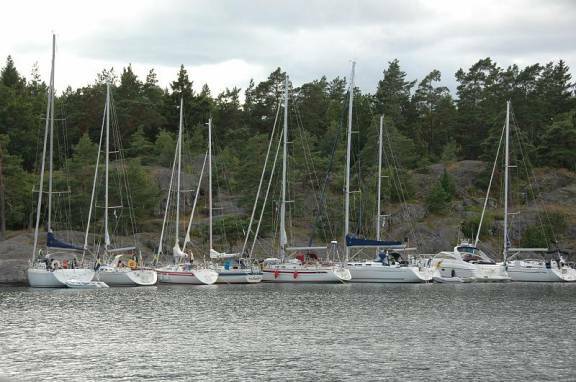 This is the greatest number of Swedish boats we have seen swinging at anchor. There are the requisite guardian gulls and a begging swan family here. In the harbour the wind is calm. The boat selling ice cream, bread and strawberries came by, but we are full to the gills with goodies. The next day we moved on to Lundarna Norra, near Arkosund. We were the only boat when we anchored just before 7:00, but a sailboat and a small powerboat joined us, tying to the rocks. 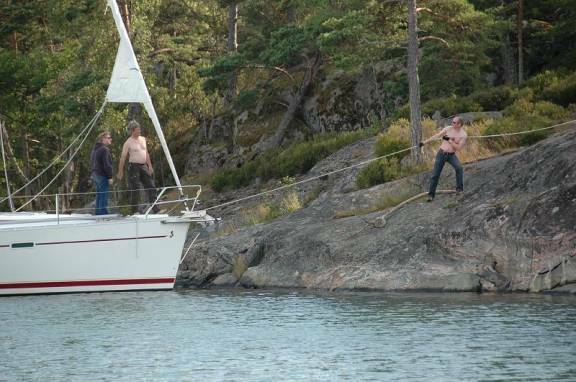 The insatiable desire for Scandinavian boaters to anchor by going bow to the rocks escapes me. We watched a power boater spend the better part of an hour trying to secure his boat to shore only to move when he was blown off the rocks by a thunderstorm. He spent another half hour securing to a second spot. He was not the only person on board … a young lady (relationship unknown but maybe under review) spent the entire time holding onto the bow line in the pouring rain while the skipper tried to figure out a more permanent mooring point. It would have taken them 15 minutes max to drop an anchor, set it and retire for the night, but no, they needed the rocks to keep them safe. The next morning, the boat was gone. We think it left sometime in the dead of night, uncomfortable with their second attempt to tie to the rocks. 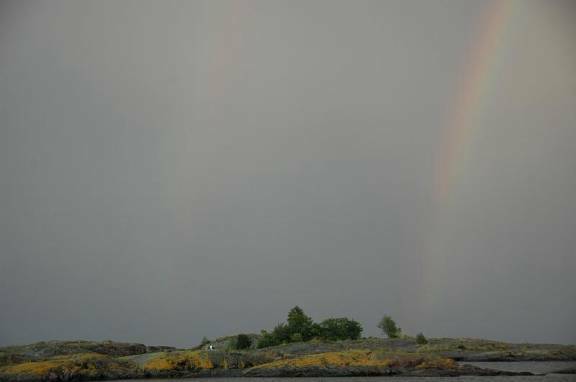 We experienced some magnificent thunderstorms after we anchored, including one producing a double rainbow. 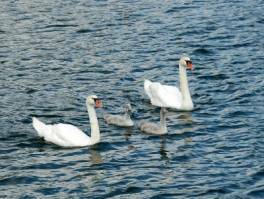 Six swans and one black-backed gull kept watch over us. Despite continuing SW winds, we pushed 20 miles further SW to Bondekrok, near Valdemarsvik, another delightful harbour with fish jumping. It is our practice, when we anchor, to have a float attached to the anchor to indicate to us and other boats where are anchor has been deployed. Our anchor float is currently an old small fender with PILGRIM letters on it. No one has ever shown any interest in it until the past week. So far three times people have passed it and put it in their boat, trying to make off with it (a bit difficult since it is attached to a 65 pound anchor). Today, one of the folks in the camp on this bay rowed out and tried to take it, thinking (he said) that it was a float marking a fishing net. Whether he wanted the fish, net or float was not clear but he was rather upset that he couldn’t make off with whatever he wanted. We hoped for a bit of a sail in a combination of inside and outside routes to Långö Trässö, NE of Vastervik, but the winds were flakey so we motored the entire way. This is one of the best of our archipelago anchorages. Perhaps we love it because it really mimics the North Channel. The granite cliffs are steep, the cedars and birch perch precariously on the cliffs. 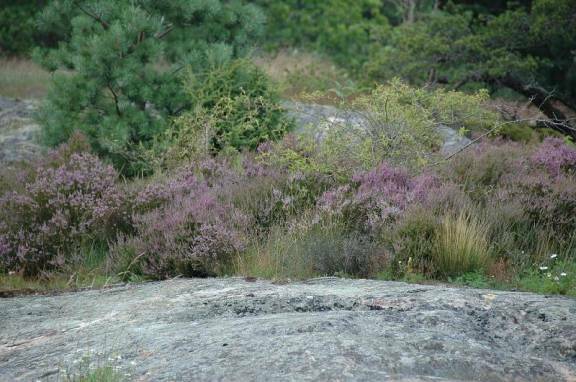 The wildflowers are profuse, especially the purple heather. 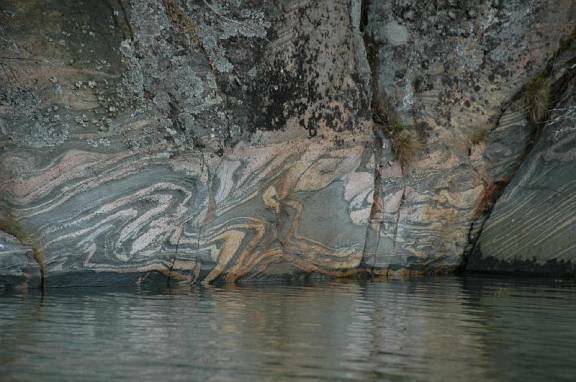 The veins in some of the granite cliffs are spectacular … really fine kitchen counter material. We launched the dinghy after anchoring in the early afternoon and found the “dustbin” (trash receptacle) and then rowed into shallow bays, greeting the Canadian ambassadors (geese) and watching spellbound while a heron stalked a fish, and caught it! After dinner, an open boat putted around the corner and approached each boat, selling freshly smoked fish (salmon and a flat fish … naturally we bought some of both, and the flatfish was great … both salty and smoky with a firm flesh). We had expected local fishermen selling their catches all along the coast, and here we finally experienced it. The fisherman said ours was the first Canadian boat he had ever seen in these waters. Gale warnings were back in the forecasts for the waters west and south of us (west coast of Sweden, and southern Denmark / Sweden), and the GRIB files indicated we would have strong southerly winds over the next two days. This was a great place to wait for the weather window to sail to Gotland, 60 miles east of the Swedish mainland, midway between Sweden and Estonia.